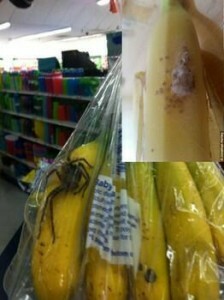 For one girl in the United Kingdom reaching for a healthy snack like a banana could have taken a turn for the worse. Hannah John took a banana to school to eat for morning tea and noticed that there was a hole in the skin of the banana, as you can imagine Hannah let out a terrifying scream once she had noticed that there were 80 tiny spiders in the banana. In the United Kingdom they source there fresh fruit and vegetables from Costa Rica, Brazil, Colombia and Ecuador, these countries house some of the most venomous spiders and could of potentially been a fatal experience for the young school girl who throw the banana in a bin outside of the classroom. Fortunately we here in Australia we don’t source our fruit and vegetables from these countries but it doesn’t mean that spiders and other pests have not closed up shop in our fresh produce. It is always vital to inspect all of our fresh fruit and vegetables for any sign of disturbance from pests and if found to throw out that produce in an outside bin to avoid any nasty mishaps or infestations occurring in your home. Below is the link to the news article regarding the girl, the banana and the spiders.